wolvar and gorloc..new scryer and aldor? me's thinks so. This will be one of those factions, witch you can chose in the new expension (Wrath Of The Lich King.) The other faction you can chose is The Oracles. When you have chosen a faction you will be at war with the other faction. Im sure that many ppl are thinking atm: what is wolwar? what do they look like? well i got the answer! When i got to choice from Oracles and wolwars i rly gonna pick Oracles. Honestly I cannot imagine myself going with any faction other than the Super-Murlocs (Oracles). I don't care if all engineering / hunter rewards are with these dudes, Super-Murlocs are FTW. In order to begin gaining reputation with The Frenzyheart Tribe, kill Pitch. This will cause Tracker Gekgek near by to offer the quest Playing along. It should be noted that chosing between The Oracles and The Frenzyheart Tribe will not have a big impact on quests and quest rewards like it did with Scryers and Aldor. There is also no way to change between the two once you have picked a side. anyone have any idea which faction a death knight would be good for? This is the choice of the two for rogues. The throwing and pants are much better than the Oracles belt. Not to mention the trinket is much better for rogues than the Oracles trinket is. These 2 quests will give you 1200 rep. (non human) Then at revered it will open the other 5 daily quests. When you do this quest your reputation with the Frenzyheart Tribe goes to hated. Follow through with all the quests. When you get to the quest to kill Artruis the Heartless (http://www.wowhead.com/?npc=28659) (the quest is A Hero's Burden - http://www.wowhead.com/?quest=12581) and get to Artruis there is a Frenzyheart and Oracles npc encased in ice. When Artruis gets to 30% health he bubbles and the NPC's pop free and start attacking you. What one you kill determines if you go with the Frenzyheart or The Oracles. If you kill The Oracles one you go back to Honored with Frenzyheart. If you kill the Frenzyheart you stay friendly with The Oracles. Check the reputation items for each before you choose what one to kill. Edit : There is no actual daily quest that is given by an NPC to switch factions. Simply go and kill Artruis again. Kill the Frenzyheart if you want to switch to The Oracles and vice versa. For me its the other situation I take Frenzyheart but I wana have Oracle I probably can switch but I dont know how any one can help me? Looking at the quest list, it seems that many are alliance only. Is this true? If so I may choose the frenzyhearts instead. So is it possible to get both factions to Exalted and just be able to switch back and forth with the daily? There are three achievements in the game for the two tribes. Reaching exalted with each. (that's two of the achievements) Then there is the third..........reaching exalted with both the Frenzyheart AND The Oracles. So, what's the story? This kind of leads the player to believe that it is possible to gain rep with both at the same time.... or can you only do so by getting exalted with one and then switching to get exalted with the other. Anyone know the definitive answer? Each day Frenzyhearts offer 3 daily quests. All of these quests are obtainable at Frenzyheart Hill, which is to the south-east from the River's Heart. Thus each day you can get 1700 rep in total, and it would take 20 days to reach Exalted. Note about switching factions: when you do so (it involves saving either Zepik or Jaloot from Artruis the Heartless), your reputation with one faction will be reset to 0/12000 Honored, whereas with other faction you will become Hated. Although the quest to switch faction is daily, it's not advisable to do it every day as your reputation will be reset each time you switch faction from one to the other. I would recommend to first pick a faction which you don't like and grind reputation with them till Exalted, afterwards switching to the other faction and staying exalted with them forever on. After all the quests that I had done for the Frenzyheart Tribe, I had become attatched to them. Unfortunately I had to stay with The Oracles cause they have the best things for my character. so, in order to open up the dailies for the frenzyhearts, i must do the quest that makes them hate me, then save the appropiate<sp> npc? then start from 0 at honored? i`m still un sure. So, with all the dailies for the Frenzyheart it's just pretty much random on the same 3 people? Also, it's only 3 dailies correct? Or are there others not in the Frenzyheart camp? Thesse guys can be found in Sholazar Basin. In order to start gaining rep. with them, you have to pick up the quest chain (http://www.wowhead.com/?forums&topic=54875). At the near end, kill the Oracle faction member and you are honored with the Frenzyheart! As a reward, you get Discusting Jar, too (http://www.wowhead.com/?item=44717). I cant see the big differense between the two factions for me. Im a mage (pvp player) which got tailor and enchanter as main profession. Which faction should i choose? hmm what's going on i gone today exalted with frenzyheart tribe and still i havent get he quest : rejek first blood .. and i miss only this for the archievement.And i want to go exalted with oracles but cannot cause i want to complete all frenzytribe's daily quests...Anyone has the same problem? By the way, don't be an idiot like me and expect to be able to wear, IE. the pants from Frenzyheart after you switch factions. Stupidly enough, the items require you to have the reputation to wear them, not just to buy them. GMs won't revert it either. I've seen several comments around Wowhead implying that engineers should choose Frenzyheart, but looking at the reputation rewards and quest rewards I can see absolutely nothing to support this. Does anyone know if this is true or not? Just got to exalted today with these guys, and decided to swap to the Oracles for the mercenary achievement, however I noticed when you change, the counter for X exalted reputations goes back to what you had. ie. you get to exalted with Frenzyheart, counter for the achievement 35 Exalted Reputations goes to 31/35, if you choose to start with the Oracles, you'll have 30/35 again. I have contacted a GM about this and have yet to receive an answer. It might not be meant to be like that. For instance the 10 tabard achievement will add +1 to the counter as soon as you obtain a new tabard, but it won't go -1 if you delete it. However, if this faction exalted achievement is an exception (amoung others? ), then it's still reasonable. 1. The Part-time Hunter. After killing Pitch, one of the Frenzyheart Tribesmen(wolvar) will attack you. Defeat him and he'll give you a quest. Before the next part you should decide which faction you want to choose. The Oracle or Frenzyheart Tribe. If you choose The Oracle, then kill Zeptik(wolvar). If you choose Frenzyheart Tribe, then kill Jaloot(gorloc). 26. A Hero's Burden. After you kill Artruis the Heartless your chosen ally will give you a quest which leads you back to the village where you can get your first dailies. if you're a rogue... do yourself a favor ad take the frenzyheart.. sweet pants and a sweet new thrown. If you do the daily to switch factions, you will not be able to do any of the faction dailys you choose until the next day (at least in my case). For the achievement i would do theese guys first, and then switch to the oracles, cause of that eggi thingie that after seven days hatches into a companion, and in rare cases... a mount! The posts discussing how to switch are a little misleading; you need to kill Pitch again and follow the chain of quests up to killing Altrius again, which will allow you to switch back to Frenzyheart. To switch from Frenzyheart to Oracle you will have to walk to the injured rainspeaker oracle again and follow the quest chain. I didnt think i found any of the comments talking about this: http://www.wowhead.com/?achievement=952 achievment. It says to :Earn exalted status with the The Oracles and the Frenzyheart Tribe. So i do the question .. You can actaully be exalted with the oracles AND at the same time with the Frenzyheart tribe?The answer is no.The criteria say the same too..I belive you must aquire Exalted with the one first and the do the quest http://www.wowhead.com/?quest=12581 again to go become step-by-step exalted with the other one , and stay that way. Do so and Gz you got your achievment! Kill Pitch, then do all the quests that open up. The reputation from these quests allows you to buy Friendly rep items with the Frenzyhearts. You are Hated with the Oracles. You eventually complete the quest Just Following Orders. This makes you hated with the Frenzyhearts and allows you to do a chain of Oracles quests. This chain allows you to buy Friendly rep items from the Oracles. At the end of the Oracles chain, you get a quest to kill Artruis the Heartless, who will send a Frenzyheart and an Oracle NPC against you. During the fight, you must kill one of them. Leave the other one alive. The surviving NPC gives you a daily quest that makes you 0/12000 Honored with his own faction and Hated with the other. Once that's done, daily quests open up that grant 1700 rep per day. Completing these daily quests is the only way to get Revered and Exalted reputations. If you complete the entire Frenzyheart and Oracles quest chain but can't access the daily quests, it means that you messed up on the quest that you get after you kill Artruis. Wait a day, then kill him again. Make sure that you only kill one of the NPCs he sends at you, and that you pick up the quest immediately after Artruis dies. To switch factions, kill Artruis again, let the other NPC survive, and take his quest. This puts you at 0/12000 Honored with your new faction, and hated with your old. You can then do daily quests with the other faction. You may switch factions only once per day. Getting the Mercenary of Sholozar achievement requires that you get Exalted reputation with both factions, but only one at a time. You are always hated with one of them. The Disgusting Jar from the Frenzyhearts eventually turns into a Ripe Disgusting Jar, which contains potions, booze, or a Frenzyheart Brew, which turns you into a Wolvar. The Mysterious Egg of The Oracles eventually turns into a Cracked Egg, which can contain food, one of four companion pets, or Reins of the Green Proto-Drake. After you switch factions, you can not wear items that require reputation with the former faction. You do get to keep spells you learn for the jewelcrafting recipes, the pets, and the mount. The Frenzyheart Brew keeps working, too. While doing these quest chains, you get an item that lets you summon an Oracle or Frenzyheart guardian pet to assist you while you are in Sholozar Basin. Once you start the repeatable quests, you get to choose which guardian pet you wish to have with you. There are no important rewards available at Honored. They all require Friendly, Revered, or Exalted. What struck me as strange is that although the Frenzyheart are predominantly hunters, none of the rep rewards are Hunter specific. The trinket is very good, and the pants are good, but you can obtain much better pants for a hunter in easier ways than doing three dailies each day to get enough rep. If i have Friendly Rep. with Frenzyheart, and yi have got Hostile with the Oracles... Is there then anyway i can switch it back to the Oracles? Guys sorry i see the list of the achievements and i saw that Frenzyheart Tribe and The Oracles can be exalted the same time? Cause they achievement is the Mercenary of Sholazar. Or u go exalted one of the 2 of them and after the other and get the achievement? Is it possible? and un-factioned Gorlocs can be fought in Borean Tundra. For the achievement you don't have to be exalted with both factions at once (since it's impossible). You gain exalted with one faction first, then you switch side and get exalted with the other one. Important point that I don't feel can be stressed enough, this puts you at Honored, but does not give you any rep on its own. You can save one of them while revered with the faction and it will put you back at honored, you will have to start again and rep up. I just recently started doing the dailies with Frenzyheart and later the Oracles, and one of the most annoying things, is the trip from Dalaran to Sholazar Basin. You have to either fly manually around Wintergrasp on your mount, or take the flight path route which takes even longer. But no more. At least not if you haven't done the quest Where in the World is Hemet Nesingwary? The Frenzyheart Tribe is one of the two main factions in Sholzaar Basin (the other being The Oracles). To earn reputation to exalted with either reputation, you must first begin this quest: http://www.wowhead.com/?quest=12528. This begins a quest in which you act as a slave to repay the Frenzyheart Tribe for their stolen kill. This quest line will earn you reputation towards the Frenzyheart Tribe. Now if you have already looked at the Oracles' rewards and the Frenzyheart Tribe's rewards, you probably will prefer the Oracles' rewards more (four pets and a proto-drake), vs. the one transformation item that the Frenzyheart offer. Do not worry: This quest line must be done to earn reputation with either faction. When you begin this quest line, you will first start off by earning the reputation of the Frenzyheart. You will continue their series of quest lines, until you get to the point that you save the Oracle. Accepting this Oracle's quest will make you hostile/hated with Frenzyheart but friendly with The Oracles. You will then follow their series of quest lines to earn reputation with the Oracles. You will finally come to the final quest of the series: http://www.wowhead.com/?quest=12581. In this quest, you will fight an elite that doesn't do too much damage, but unprepared foes may have trouble. During this fight he will have standard damage, with Frostbolts and melee; but at 30%, he shields himself and releases two prisoners: An Oracle and a Frenzyheart. This is where you choose which faction you want; you will kill your enemy (whichever you choose), and then your new ally will help you defeat Artruis. After killing Artruis, the saved ally will become a quest-giver. The ally will give you a DAILY quest that makes you 0/12,000 honored with the ally's faction, and the proportionally-opposite reputation for the faction of the enemy that you killed. Upon completing this daily quest, you will be able to go back to the faction's base camp and do three daily quests that will earn you reputation. There is a total of 8 daily quests, three of which appear each day. There is one daily quest for each reputation that is always shown every day, and then a daily quest that is chosen from a random four. This daily quest will be a random task that is done in the Basin. The final third daily is a random choice of three. These three dailies are quests that command you to kill 30 or 50 mobs of the opposing faction using different methods. This genocidal daily quest will give you 700 reputation each day (no matter which daily), and the other two dailies will give 500 reputation each (1700 each day -- at most 20 days of doing all three dailies a day will get you 999/1000 exalted. The faction that you choose can be changed. In order to change your decision (no matter the reputation you have currently), if you redo the Artruis event saving the NPC of the faction you want, you will become 0/12000 honored of that faction. NOTE: Redoing this quest and choosing the faction that you are affiliated with currently will reduce your reputation to 0/12000 honored, even if you are higher than that. Also note that switching factions, and then switching again (example; Oracles -> Frenzyheart -> Oracles) will still leave you at 12000. So now you know the basics. Which reputation do you choose? The main reason people earn reputation with these factions is to purchase the egg or jar that presents the user with a reward after 7 days. The egg is from the Oracles and the jar is from the Frenzyheart. There are four companion pets that are available from The Oracles. These pets will be easily found in the egg that is bought at revered. However, these pets are not bind-on-pickup, and therefore can be bought/sold via the AH. There are also two other awards: A proto-drake mount, that has a ~5% chance to drop from the egg, and aged yolk, a food item that is like normal food. The jar rewards level 70-type potions (mana, health or rejuvenation) but also has a chance to drop http://www.wowhead.com/?item=44719, which disguises the person who uses it. There are also five achievements associated with these factions. Two of which require you to earn exalted with the respective factions, and the third requires you to earn exalted with both (not at the same time). The fourth and fifth require you to do all 8 dailies of each faction. Now personally, I chose Frenzyheart first because I wanted the Mercenary of Sholzaar achievement and I knew the Green Proto-Drake would take some time for me to get. Once I finished all 8 daily quests and got exalted, as well as got the brew I switched to the Oracles. I currently have all the pets and am waiting on the proto-drake. Once I get exalted and the drake, I think I will switch back to Frenzyheart as the daily that requires me to kill the Oracles lets me kill mobs that drop clams that give me pearls. So the choice is yours. Enjoy! OK I read every posting I could find on how to switch from frenzyheart to oracles. I went and killed zepik in the cave and Jaloot didnt have a quest to offer me. Killed him three times to be exact. Still nothing. So I read some more. My rep with frenzyheart was friendly and rep with oracles was hated. I decided it must have something to do with the fact that I was only friendly with frenzyheart and that maybe I needed to get honored first. So, I started searching for dailies to do. No one that was supposed to offer me quests did. Finally I found a post that said that if you couldnt pick up any quests you needed to start with Elder Harkek in the center of the Frenzyheart tribe by the campfire. So, I went to him and whaddya know...he gave me a horn to summon Zepik. I picked up the two quests from Zepik did them and turned them in, picked up one other that turned in at Harkek and instantly was honored with Frenzyheart. As soon as that happened, I ended up with a quest to go talk to this injured oracle right across the way from the Frenzyheart tribe location. I dont know exactly where I got the quest from, if Harkek gave it to me, which i doubt since it's a different faction, or if it just ended up in my log as result of becoming friendly with frenzyheart coupled with the fact that I had just killed zepik the other day, but I went to the injured oracle and turned in the quest and boom hated with frenzyheart honored with oracles. Now I can pick up Oracle quests and all is right with the world. Hope this helps anyone else that's sort of caught in the cracks between factions. Despite the rewards that are outlined from each of the quartermasters, it seems far better in the long run to either grind other reps, or get crafted pieces, or run dungeons for items, that outweigh either faction's rewards. In fact, the only reason it seems worthwhile to get rep (achievement aside) with both factions is if you're a jewelcrafter. Is there any way to get more than 3 dailies from them a day? I got to revered and I'm still only getting three dailies. Takes a looong time to grind this out. Any news regarding rewards as of patch 3.2? One thing to consider when choosing a side, the oracles drop darkwater clams, and a couple of the Kartak hold dailys give you something to help kill them easily. I can get a stack of clams each day without much effort. 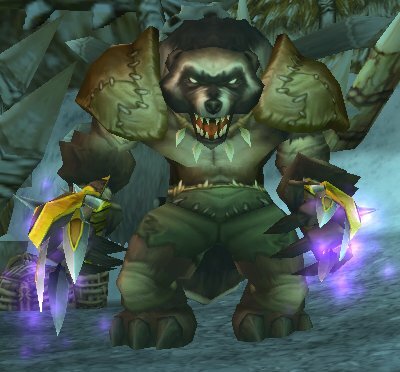 So I guess if gorlocs are supermurlocs, these guys are super-gnolls? Make SURE none of your gear- weps, trinks, etc- is based on having Oracle rep before you switch! After I switched I noticed my wand was in my bag, because, yep, it's based on Revered with the Oracles. D'oh! I don't like them....they are clearly the 'bad doggies'. They are unfriendly, want to kill all the cute litte evolved murlocs and didn't agree to the peace offer. Holy crap these guys are absolutely obliterating the Oracles! I was watching the little battle by The Mosslight Pillar and it was total one-sided... I'm definitely going Frenzyheart after watching the Oracles get their butts handed to em. I killed Altruis twice in a row and killed Jaloot (oracles) twice. It's not doing anything to get me friendly with Frenzyheart. Does my Oracles reputation goes to hated from exalted if I switch it to Frenzyheart by killing Artruis the Heartless? is rep reversable? like if you get rep with the frenzy heart can you switch it to the oracles? i think i messed up, just got exalted with oracles then killed the lich again to get rep with the wolvar however i didn't get the drake yet. what i am wondering is, if i am exalted with one faction then switch to the other, but again switch will i still be exalted with the original faction like nothing ever happened? I need some help... so my account was hacked awhile back and when I got it back I was at 4900 rep in friendly with Frenzyheart and hated with the oracles. The only problem is I can't find any quests or anything to increase my rep with Frenzy so I can switch to the Oracles. I have nothing in my inventory or bank or anything. Can anyone help? And the answer is ..... No. You'll need to re-grind that reputation up to Revered to be able to buy the Egg once again. I mean...at least you can get pets and even a mount out of it(although very rarely). Compared to the crap you get form the Frenzieheart, I'd rather have the mount than some stupid thing that turns you into wolverine. Killing members of the other faction (frenzyheart if you are on the oracles side and vice versa) will lower your rep with them further, but gain you rep with the side you are on. if you want to switch after you get exalted to get the achievement (exalted with both) or the mysterious egg etc., i suggest doing the other two dailies that don't involve killing the other faction so you have less rep to get back. There are 8 quests which are randomized each day, and you get one per questgiver, per day (3 in total per day for either faction, 1 of which involves killing the other faction and 2 which dont). I just wondered, is i possible to switch back and forth? You see, I'm hated by these guys, and want to switch back... Can I do that? How do I switch (if possible) ? Hey. Is it possible to go back and forth with the Oracles and Frenzyheart Tribe? I'm reverd with the Oracles, (trying to get the Proto-Drake) and once I get that, can I go back to the Frenzyhearts for the Brew? ok so i got the green proto and switched to frenzyheart and im honored with them but no one is offering me their dailies can i get some help with this? ANSWER to everyone asking how to pick up quests after killing Artruis and changing factions, only to find that you can not pick up any quests afterward. The issue : You're exalted with the Oracles, but you want to switch to Frenzyheart and start doing dailies and become exalted when them instead. You go kill Atruis, then you talk to the Zepik in the cave and your faction actually switches, so that you are now hated by the Oracles and Honored with Frenzyheart, however at this point you are stuck, because there are no quests. Killing Pitch does nothing. Ignore everyone saying that. They aren't addressing the issue. You can't pick up the initial quest to kill Pitch, because you already did it two years ago. None of the Frenzyheart are offering quests and you can forget about a horn that summons Zepik. You don't know what to do. Well, I figured it out. First of all, you are probably level 85. You killed Artruis too fast. If you kill Artruis too fast, Zepik and Zaloot never get released from the ice, so you can not kill one. You can talk to one after Artruis is dead and switch factions, but that's where it gets stuck. You have to actually kill one. You can only switch factions once per day. Now, you have to wait until after the daily reset and go switch your faction back to Oracles, the right way. Attack Artruis, but only use auto attack, no spells or special hits that will hurt her too quickly. Wear her down as slowly as you can. When Zepik and Zaloot are released from the ice blocks, attack Zepik, again, only with auto attack. One shotting him will despawn all of the mobs and you have to wait and start over. Once he is dead, finish off Artruis, continuing to hit only with auto attacks. Now go talk to Zaloot. Your faction switches back to Honored with the Oracles and hated with the Frenzyheart. Wait for the daily reset. Go back and repeat this process, but kill Zaloot this time. Now talk to Zepik and your faction switches back to Honored with Frenzyheart and Hated with the Oracles. Now, talk to Zepik again! He has another quest for you at this point, which will lead you to the Frenzyheart camp and open up the dailies. This procedure has been fully tested and approved by yours truly. Please mark this up, so that it stands out, because I searched for hours for an answer to this dilema and never found one, so had to spend days figuring it out myself. Do you have to be exalted with these guys in order to switch to the Oracles faction? I killed Artruis, but he didn't sent any NPC on me. They were frozen. Maybe it has to do with something that I killed him to fast, but I let him live on 5% HP for some time, he didn't do anythingm got tired and finished him. And after he died, I had quest mark on each of NPC. I chosed faction I watnted to switch - in this case Frenzyheart and I got 60k rep which turned them to honored. Hoping that this info helps someone, don't know why he didn't realese them. Problem is, I don't have any daily in their settlement, maybe it isn't working instantly, first day, will check tomorow, if not, will send a ticket to GM. So am i screwed and can't abandon quest the wolvar gave me to go back to their camp or can i still do something to rewind and go back to the oracles? I don't know I'm so confused. I was with the Frenzyheart and still am since it won't let me switch back. I killed the Altruis guy and chose the Oracle to save and killed the Wolvar. After killing Altruis, there is no quest for me to pick up to start gaining rep with the Oracles. Am I doing something wrong here? And I also noticed that before I killed Altruis, the Frenzyheart wasn't giving me any dailies even though I had done them before Cata was released. I just finished the Frenzyheart half of the chain (up to Just following orders) and I am at 600/12000 Honored. Does one have to finish the chain to choose sides before getting the dailies? Is the only (and then, by definition, best) way to go through the entire chain, pick a side, then run dailies? Also, does your rep go to 0/12000 Honored for whichever side you choose? if your lvl 85, can't you take the quest that allows you to gain reputation with the oracles? hmm i have to get the quest from the frenzyheart leader and have to kill the lich slowly and then kill the frenzyheart guy! but the my problem is that i can't get the quest from either of them since the quest aren't showing itself sort off. Long chain quest with those guys begins with Playing Along. You cant start it when u already chose oracles - The Part-time Hunter. But you can change the faction which you want by this quest A Hero's Burden. i have just switched at lvl 85 from exalted oracles to frenzyheart in order to obtain the associated achievements. Dunno if it is just me but instead of getting 0/12000 i started at halfway in honoured meaning about 6000/12000. After doing this i did the dailies just before reset and then at the reset i picked up the next ones. Even though most of the comments mention that you only get 3 daily quests i somehow picked up 4. Not sure if this was a glitch or it is a permanent thing but even if it is a glitch and you only get 3 daily quests, you need 11 days for the revered bar and 3-4 days for the half honoured bar. meaning that you need a total of 15 days instead of 20 (as stated in previous comments) in order to hit exalted. Side note: i am not a human (hence no extra rep), and i am in a guild that offers the reputation buff (550 instead 500 rep and 750 instead of 700rep). So I have a question. I see little Frenzyheart pups roaming around the camp, but where are their moms? There don't seem to be any females in the camp. I had some problems with changing faction. I killed Artrius and had chosen to switch. My rep changed but there were no daily quests available. It is not enough to kill Artrius & accept the daily to switch the faction - you HAVE to kill the Frenzyheart or the Oracle. As a level 85 you kill Artrius in generally much too fast. So kill him slowly to enjoy the dailies afterwards. It is very important if you're trying to unlock these dailies at lvl 85+. If you one-shot Artruis then you are doing it wrong, DO NOT ACCEPT/COMPLETE the daily offered by EITHER faction. Make sure the faction you want dailies for is no longer within an iceblock. If they are still blocked, it will bug for you. You have to slowly dps Artruis down until he free's them, and then you must kill one of them (the one for the faction you do not want) and then kill Artruis. When done correctly, Artruis and the other faction character will both be dead, and your faction person will no longer be in a block of ice. Then the dailies will be properly unlocked. If I by mistake picked Frenzyheart but I wanted The Oracles, am I still able to change faction? Wait you can get a pet from the Oracles? And a mount? I think I missed this...anyone know the names of them so I can look them up? Took me a couple days to fully get this quest to work properly. Being level 90 I had to take off some of my gear, my trinkets, my rings and my weapons and literally fist fight Arturius. Once you see the chains STOP ALL dps and target Jaloot for Frenzheart and focus ALL dps on him until he's dead then you can refocus Arturias and knock him down. Once you have killed Arturius you will have a blue quest marker above Zepik. Once you have picked up that quest BAM you are now honored with the Frenzyhearts again. IF you have killed Arturius and Jaloot correctly as soon as you pick up a complete the blue quest then you'll immediately get another quest to go back to Frenzyheart Hill. Once you have returned to the Hill and turned in the quest you open dailies...YAY! You have to do the dailies to get to exalted and there are only about 3-4 dailies per day but each one gives you anywhere from 500 to 800 reputation points. Good luck to everyone trying to get their rep with Frenzyheart or as the Oracles call then stinky puppy men lol. Nobody says how to do reputation for the alliance :/. I'm currently Honored with the Oracles, but I want to switch to Frenzyheart so I can get that out of the way first, then go back to the Oracles so I can (eventually) get the Mysterious Eggs. However, I can't get the quest after killing Artruis and Jaloot. I'm unequipping everything and just fist-fighting him, and then I quickly switch to Jaloot, kill him, then go back to Artruis. Zepik is a friendly NPC afterwards, but the rest of his tribe still hate me. I really can't figure out what the heck I'm doing wrong, so any suggestions as to get past this issue would be appreciated (if possibly long in arrival). As of the Warlords of Draenor opening event patch, faction-switching appears unpassably bugged. Killing either Zepik the Gorloc Hunter or Jaloot will not open the quest for the other faction, even if the kills are done correctly as described in other posts -- that is, you bring Artruis the Heartless down below 30% without killing him, kill the faction champion you don't want slowly, and then slowly kill Artruis. No quest appears, and your chosen faction is only raised to Neutral. I have put in a ticket, and will update if I get any response. You can Realm Hop and get three more quests from Rejek every day. Most of the time I can only get two extra each day but occasionally I can get all thee. Note sure why yet. This does not seem to work on the Oracle side but I will keep checking as I get high rep with them and update if it changes. Also, if you are like me and trying to get the achievement Mercenary of Sholazar you can do it on two separate characters so you're not having to switch the faction and start the rep grind all over again. Then start the quest chain, and your rise to rep.
Watch out, if your like me just half playing and the other brain half is watching a movie on the other screen, and you just auto take quest. You are now Honored with Frenzyheart Tribe. Lightning Definitely Strikes Twice completed. You are now Friendly with The Oracles. You are now Hated with Frenzyheart Tribe.